The tiger living here, called the Ussuri, Amur or Siberian tiger, has been the official symbol of the Primorsky Krai since the times of the Russian Empire. In order to escape from the cold and to survive in the deep snow, it has grown warm long fur, which no other tigers living in the southern countries have. There is even a more rare cat here – the Amur leopard living in the Khasan District in the south of Primorsky Krai. While the tigers number about 500 animals, there are only about 50 leopards left. However, the Federal Government has recently taken measures to restore the population, and scientists, with cautious optimism, are talking about the gradual growth in the number of wild leopards. Tropical fish species can be found in the rivers of Primorsky Krai – the snakehead, Chinese bass (Chinese perch), Chinese sleeper creaking loudly in the air with its hard spines, located on the sides and top of the head. The taiga in the Primorsky Krai is an unusual combination of subtropical and subarctic trees. Here you can find the cork tree (Amur cork tree), medicinal ginseng highly valued in Oriental medicine, lemongrass (liana with red berries tasting like lemon), sultanas (a relative of kiwi – a berry with the size of a large grape growing on vines). Local people gather pine nuts, fern sprouts, and ramson in the forest. 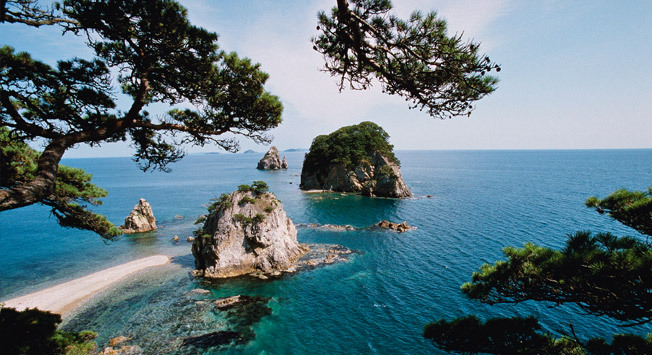 In the Sea of Japan, washing Primorsky Krai, southern fishes (e.g., poisonous fugu, much valued in Japanese cuisine, and sharks) meet with northern fishes – herring, pollock, and navaga. The best beaches in the Primorsky Krai are located on the southern coast: in the Khasan District, and in the vicinity of the port cities of Nakhodka and Vladivostok. Local residents are actively involved in diving and fishing, as well as harvesting shellfish from the seabed (by the way, the local mussels and oysters are larger than their European relatives). Several nature reserves, wildlife sanctuaries and other protected areas have been created in the Primorsky Krai. Among the newly established, we should note the Land of Leopard National Park in Khasan District. The coast of this district is adjacent to Russia’s only Marine Reserve in the Far East, which is a vast water area with a special environmental regime. In addition, there are areas where not only the natural wealth, but also the traditional lifestyles of indigenous peoples of Primorsky Krai have been preserved – the Udege, Nanai, and Taz. While the initial main aim of the reserves was to preserve the nature, now officials, scientists and businessmen focus more and more on eco-tourism. Thus, the authorities of the region intend to create an ecotourism cluster capable of receiving up to 700,000 tourists per year in the Khasan district. There are similar plans in respect of the northern districts of the region. For example, the Sikhote-Alin Reserve is of great interest to foreign tourists, especially the Japanese (the routes of the Russian traveler and writer Vladimir Arsenyev came through the reserve, and, based on his book “Dersu Uzala”, the Japanese director Akira Kurosawa shot the film of the same name, which won an Oscar). “The reserve should become an attraction for eco-tourists, and we have plans for the development of cultural tourism infrastructure for 2014. We look forward to the revival of small aviation services in the region,” said Dmitry Gorshkov, Director of the Sikhote-Alin Nature Reserve. In addition to protected areas, the Primorsky Krai has a number of locations enjoying no less popularity among tourists. They are, for example, the Kravtsovsk and Benevsk Waterfalls, the Mokrushinsk Cave, the “heart stone” in one of the bays of the Khasan District, which was depicted by the writer Mikhail Prishvin, Livadia Mountain (more widely known by its old name – Pidan), which, according to popular belief, is inhabited by coastal Yeti – flying forest people. Wild animals of the Ussuri taiga in their natural environment can be found in “Safari Park” near Shkotovo (about 100 km from Vladivostok). Wild boars, bears, deer, and even tigers live here on a specially fenced forest area.